Michael Woodford always thought he was a good judge of people. But that view changed radically after he was ousted from his position as chief executive and president of Olympus Corp., the Tokyo-based camera and medical-imaging equipment maker for whom he had worked for more than two decades. 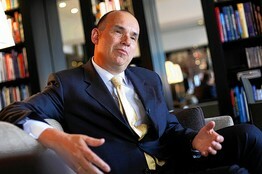 Reuters Former Olympus CEO and President Michael Woodford sought police protection in London. $1 billion, and a payment of fees close to $700 million to a financial adviser based in the Cayman Islands. Given that the values of the acquisitions were subsequently, and swiftly, written down, they looked surprisingly reckless, while the advisory fees, at 30% of the value of the acquisition instead of a more usual 1% to 2%, seemed outrageous. After giving an interview about Olympus’s losses and the behavior of its board to an international financial newspaper which broke the story globally, he fled Japan, returning, in fear for his life, to the U.K. where his safety was monitored by police for several months. A subsequent investigation in Japan revealed that the acquisitions and fees were part of a 13-year effort by Olympus to conceal investment losses incurred in the 1990s. The Nikkei-listed company admitted to hiding these losses in November 2011. Several Olympus executives, including Mr. Kikukawa—who resigned as Chairman only 12 days after forcing Mr. Woodford out—were subsequently arrested in connection with the affair. In September, Mr. Kikukawa pleaded guilty to charges of falsifying accounts, covering up losses of $1.7 billion. Meanwhile Mr. Woodford sued Olympus for unfair dismissal; the suit was settled out of court in May 2012, after seven months, when he was given a £10 million ($16 million) payout. Mr. Woodford, who spent most of his working life with Olympus, has no regrets about how he behaved toward his former employer; indeed, he doesn’t see how he could have done it differently. Mr. Woodford has the international media to thank for that global spotlight. During the months following his dismissal he was on the phone with every journalist willing to listen to his story. But while his story made headlines all over the world, there was one place where interest was distinctly muted: Japan itself. “When [Mr.] Kikukawa fell and it was so transparently evident that you don’t spend a billion dollars on three companies with no turnover, [succeeding CEO] Shuichi Takayama stood up and said these were important strategic investments; we needed to pay the $700 million in fees because we needed good advice. For him to do that and the Japanese journalists writing it all down—you start to think this country [Japan] functions in a different way from anywhere else on the planet. “When things come out in the West they are looked at and processed in a logical way. Wrongdoing isn’t a monopoly of the Japanese. But in Japan, the press is so gentle, so passive, self-censoring, that they didn’t report the story, despite the magnitude of it,” he says. While Mr. Woodford gained some friends among international journalists with his revelations, he acquired enemies too. Shortly before being fired, he started to fear for his life. “I thought I was going to be assassinated. It was horrible.” On his return to London he went to the Belgravia police station on Buckingham Palace Road on Buckingham Palace Roadto request protection. After convincing the duty officer that his story about the Japanese Yakuza possibly trying to kill him was legitimate, Scotland Yard flagged his telephone numbers for priority response. “I went from a ‘fruitcake in a suit’ to a high priority,” he writes. But even as his Spanish wife, Nuncy, was nearing a nervous breakdown and begging him to stop, Mr. Woodford felt compelled to go through with exposing Olympus. “I was desperately passionate to get to the truth. And if I hadn’t, I would have been destroyed,” he says. And despite the size of his eventual unfair-dismissal payout, money, on his return, was also a worry. While at the center of a media storm, Mr. Woodford received no money for exposing his company. In fact, he was bleeding cash fast. “I thought I was going to go bankrupt, that I was going to run out of money. I spent nearly £1 million on lawyers in a few months. I was in the process of remortgaging my house next. I gave up a multimillion-dollar job,” he recalls. But while the going got really tough, he acknowledges he had it easier than others in some respects. “I think it is easier if you are high up. If you’re 27 and have three kids at school, it’s not easy. I had a British passport, I could get out and I was the president. My voice could be heard and it was much more newsworthy. Somebody within the company was whistleblowing before me. They went to [Japanese financial magazine] Facta and they were ignored in Japan,” he says. Mr. Woodford is now is a staunch believer in external whistleblowing lines as a bastion of corporate responsibility and transparency. These are company-financed communication channels to independent monitors with carte blanche to investigate allegations, through which employees can report wrongdoing.